The first six months of 2013 were a roller coaster ride for investors. “The value of investments can go down as well as up”. 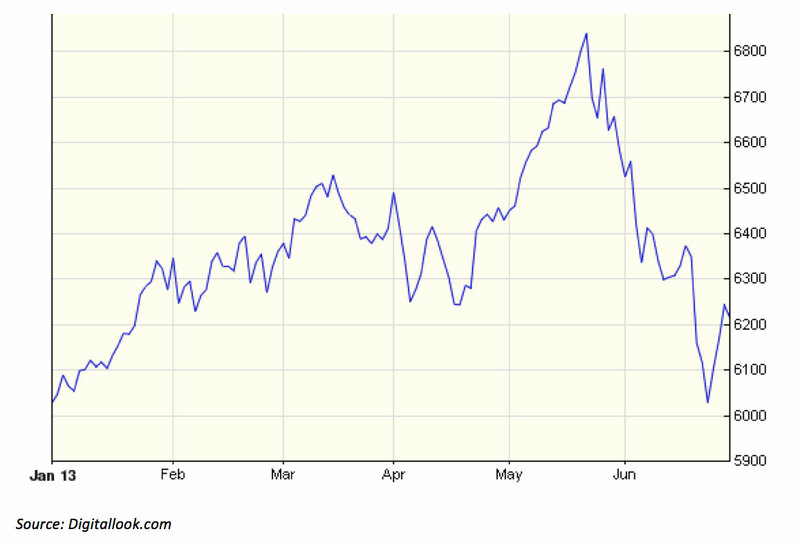 That familiar warning has been all too true over the first half of 2013, particularly in terms of the UK stock market. 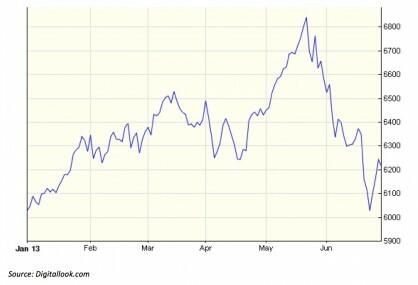 If you had hibernated for the first six months of the year – it has mostly been winter, after all – you would have woken to find the FTSE 100 318 points (5.4%) above the level at which it started the year. Not bad, especially when you add in the six months of dividends, worth about 2%. What you would have missed during your slumbers was a 16% rise in the market to 22 May followed by a 9% decline over the remainder of the period. It was a similar story in most other major stock markets, with Japan experiencing an even greater roller coaster ride: the Nikkei 225 started the year at 10,395.2 and climbed to 15,627.3 before eventually ending June at 13,677.3. The bifurcation has largely been attributed to one man – Ben Bernanke, chairman of the US Federal Reserve – and his pronouncements about the future ‘tapering’ of quantitative easing (QE – electronic ‘money printing’). Nobody in the markets had been expecting that QE would carry on forever creating $85bn a month to buy bonds, but to borrow a US banker’s memorable phrase from shortly before the credit crisis hit, “As long as the music is playing, you’ve got to get up and dance”. What will happen when Mr Bernanke starts to turn down the music’s volume was the big worry for investors – hence the rush to the exits in recent weeks. However, in the panic, little attention was paid to the provisos which the Fed Chairman had placed on the taper process. It will be subject to satisfactory US economic performance, so if unemployment does not fall as expected or inflation drops further, the tapering could be undone. By the end of June, that conditionality had started to sink in, helping the markets to recover their composure and some of the losses. ← Child Trust Funds: Is the end nigh?